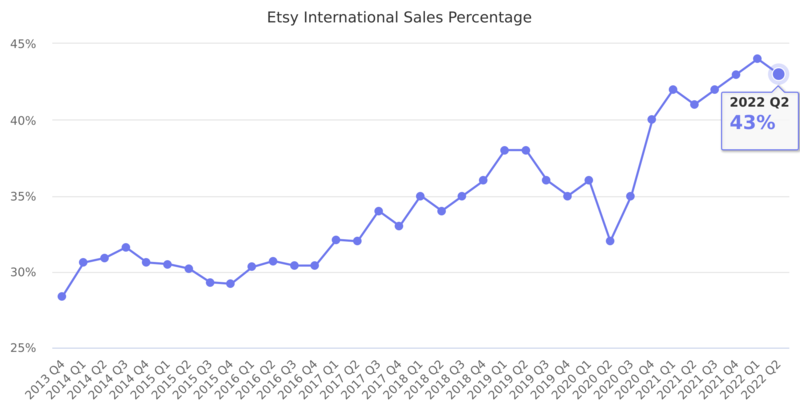 Percent of sales where either the billing address for the Etsy seller or the shipping address for the Etsy buyer at the time of sale is outside of the United States. In the first conference call as a public company, the CEO said this about the international growth: "Over time, we think our global-local strategy will drive international GMS to 50% of our total GMS." He repeated the same statement in the Q2 and Q3 conference calls. Last reported quarter 2018 Q3 it was 35.0%, up by 3% year-over-year from 34.0%.